Key players in the construction market expect a 23% increase in demand for structural steel between 2014 and 2018. For steel manufacturers, the entire steel process must use technological advancement to increase production yield. This includes adapting automation and upgrading its computing system. That is why setting up industrial computing devices with compatible peripherals is essential for steel manufacturing operations. This allows convenient navigation of multi-faceted applications for seamless steel processing. Good thing, our TB50 industrial trackerball is suitable for steel-making processes. Its compact footprint saves up the workspace so larger machinery can be easily installed. It has an ergonomic structure allows a straightforward program navigation, which is crucial for an efficient operation. Moreover, trackerballs are also more accurate to use since only the fingers are required to move the pointer. So, how can steel operators take advantage of using the ruggedised TB50 pointing device in steel manufacturing processes? In this blog, understand why this industrial-grade device is the right peripheral solution for panel PCs used in steel factories. Steelmaking process requires careful monitoring to ensure high-quality output. That is why compatible computing equipment is embedded in the system processes for quality control and monitoring. Likewise, steel operators should be able to seamlessly navigate applications to reduce bottleneck operation as well. And, this results in improved productivity and operational efficiency. Now, having a TB50 rugged trackball integrated to embedded PCs can enhance workflow efficiency. It promotes precise navigation with lesser errors in terms of command input. Therefore, downtime due to miscalculation is reduced and potential risks are mitigated. What’s more, its stainless steel construction frame is highly-resistant to corrosion, shock and abrasion damages. But, rest assured that this device can function well in steel operations. Here are some of its outstanding features that can help in optimising automated functions in steel processes. The equipment used in steel-making must have a sturdy construction that meets industry standards. Fortunately, the TB50 ruggedised trackerball has an IP65/NEMA4 rating. Its robust design can protect the inner components that may be potentially damaged by moisture, dust, extreme temperature and vibration. Hence, operators can experience better system navigation even over extended periods. Steelmaking process has different operational and interface requirements. But, the industrial trackball TB50 series have customisable interface options. It includes USB, PS2, AT, SUN and many others. So, this feature allows the peripheral for easy installation and integration to panel PCs with specific prerequisites. The rugged TB50 trackerball pointing device also has a Polyester overlay which makes it resistant to acids and chemicals. So, this device can be installed in areas that are exposed to such elements as it can withstand damaging conditions. Of course, steel plants always bear varying temperatures which can cause hardware failure. But, the TB50 rugged trackball can operate optimally at -20°C to +60°C temperature. Therefore, steel operators can continue to experience seamless navigation for an improved production efficiency. As of today, steel manufacturers are gradually adopting the technological advancements in operations. Apart from implementing the automated system, steelmakers are opting for the most suitable computing solution. But, having an industrial PC is only a part of efficient operations. So, building panel PCs with compatible peripherals like TB50 trackerball can help elevate a manufacturing process. 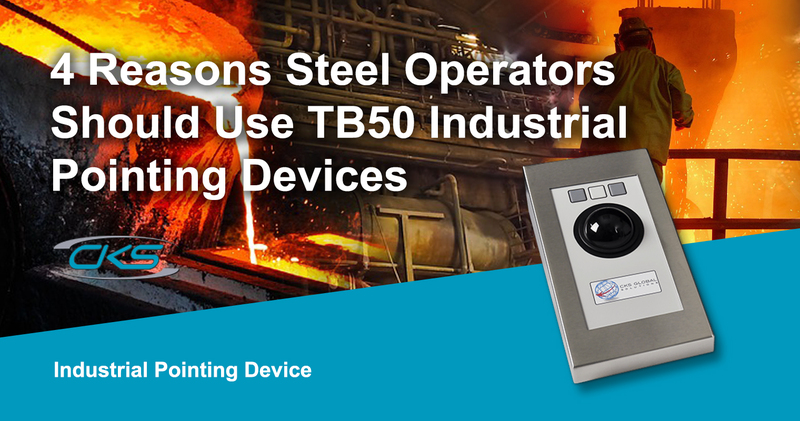 Contact an industrial computing device manufacturer today to learn more about the TB50 trackerball for steelmaking operations.